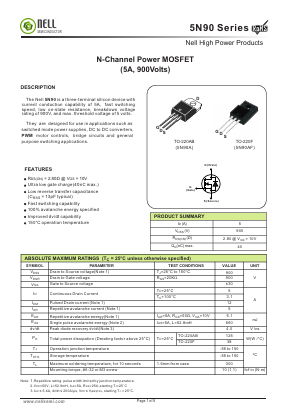 They are designed for use in applications such as switched mode power supplies, DC to DC converters, PWM motor controls, bridge circuits and general purpose switching applications. The Nell 5N90 is a three-terminal silicon device with current conduction capability of 5A, fast switching speed, low on-state resistance, breakdown voltage rating of 900V, and max. threshold voltage of 5 volts.